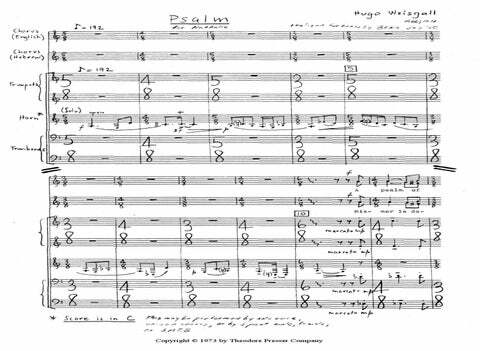 “One of America’s most important opera composers, Hugo Weisgall’s output also included orchestral, chamber and choral works, eight major song cycles, and music for ballet. 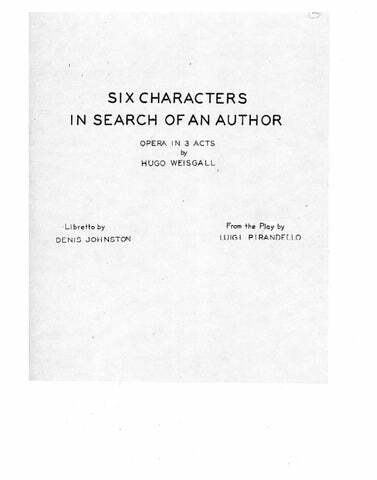 His opera Six Characters in Search of an Author brought Weisgall national acclaim when it was first performed by the New York City Opera in 1959. The same company commissioned and performed his Nine Rivers from Jordan in 1968, and later staged his Esther, based on the biblical story. His other operas include Athaliah, The Gardens of Adonis, Jenny/or The Hundred Nights, Will You Marry Me?, The Tenor, and his most frequently performed opera, The Stronger. Born in Czechoslovakia, he came to the U.S. in 1920 with his parents. During World War II, he was assistant military attaché to the governments-in-exile in London, and later served as cultural attaché in Prague. (9 Poems from “Herrick’s Hesperides”) for Baritone and 5 Instruments 23:00 Fl. Cl. Vla. Vcl. Pno. Opera in two parts. 1:45:00 2(Picc. AltoFl.) 2(E.H.) 2(EbCl. B.Cl.) 2(Cbsn.) – 2 2 2 0; Timp. Perc. Str. Opera in 3 acts. 2:10:00 3(Picc. AltoFl. ), 2(E.H.) 2(B.Cl.) 2 – 4 3 2 1; Timp. Perc. Hp. Str. Prologue and 3 acts. 2:25:00 3 3 3 3 – 4 3 3 1; Timp. Perc. Hp. Str. One act opera. 35:00 2 0 2 1 – 1 1 0 0; Timp. Perc. Pno. Str. Opera in Two Scenes and a Prologue, after “Venus and Adonis” by William Shakespeare and the play of the same name by André Obey. 1:50:00 3(Picc. AltoFl.) 2(E.H.) 2(A Cl./ B.Cl.) 2 – 2(or4) 2 2 1; Timp. Perc. Pno. Hp. Str. Opera in One Act, after the play by Strindberg. 25:00 Eb AltoSax.(BbCl./EbCl.) Ten.Sax.(BbCl. B.Cl. ), Tpt. 1Vln. 1Vla. 1Vcl. 1Cb. Pno. One-act opera. 25:00 Cl./Sop.Sax. Cl./AltoSax. Bsn. Hn. Timp. Pno. Perc. 2Vln. 1Vla. 1Vcl. 1Cb. from the Ballet “Outpost” 17:00 3 3 2 2 – 4 3 3 2; Timp. Perc. Pno. Str. for Soprano and Orchestra 16:30 Solo Sop. ; 3 2 2 2 – 4 2 2 0; Perc. Hp. Str. for Baritone Soloist and Orchestra 17:45 Solo Bar. ; 3(Picc.) 3(E.H.) 3(B.Cl.) 2 – 4 3 3 1; Timp. 2Perc. Cel. Hp. Str. 9:30 3 3 2 2 – 4 3 3 2; Timp. Perc. Pno. Str. 14:00 4(Picc.) 4(2E.H.) 2 2 – 4 4 3 1; Timp. Perc. Pno. Str. 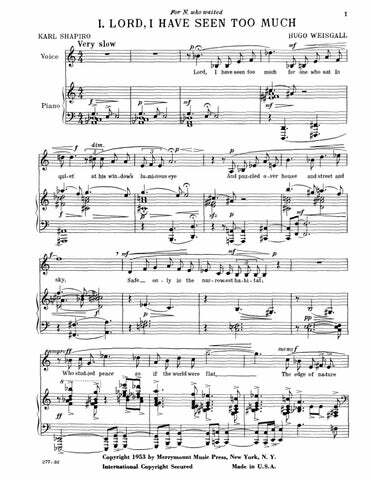 Soprano Aria from “Six Characters in Search of an Author” 5:00 Solo Sop. ; 2 2 2 2 – 4 2 2 1; Timp. Perc. Str. for Baritone and Orchestra 25:00 Solo Bar. ; 2 2 2 2 A.Sax. T.Sax. – 4 3 2 1; Timp. Perc. Str. 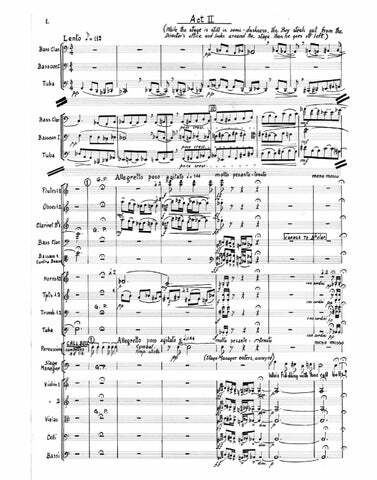 for Tenor, Soprano, SATB Chorus and Orchestra 26:00 3 2 2 2 – 4 3 3 1; Timp. Perc. Hp. Str. from the Ballet “Quest” 13:30 3 3 2 2 – 4 3 3 2; Timp. Perc. Hp. Str. Mr. Weisgall is a tremendously gifted and vital composer, unquestionably one of the finest in the American lyric theater. Weisgall’s opera, atonal and decidedly modern, balances a lack of centeredness and musical comfort with his use of lush timbres and textures. He uses familiar forms, like the aria, duet and trio, to create a flowing, well-paced musical narrative. 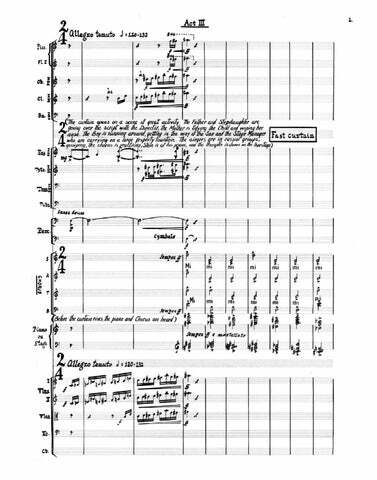 The composer’s triumph could not have been more complete. One hopes [Esther] will return in following years. Hats off, gentlemen. An opera. Weisgall’s score is thorny, modern and uncompromising. Yet he had a keen feeling for drama and deployed his complex harmonic language in a masterly, vividly dramatic way. The stark and uncompromising Esther is a powerful evening of musical theatre. “Esther” is stageworthy and enjoyable… Mr. Weisgall wrote big: dramatic orchestra, lamenting Verdian choruses, lots of declamatory vocal lines. Mr. Weisgall is clearly a theatrical technician of the first rank. …a real and exciting opera, powerful in its own right…well worth repeated hearings. …a work of great originality and superb craftsmanship, and certainly, if there is any musical justice, it will be kept in the repertory until it is recognized for what it is…a major achievement of the contemporary musical theater. The Gardens of Adonis stands out as an unusual, beautiful and provocative work of musical art. It is a fascinating little work, with constantly changing emotions, a superbly expressive vocal line and colorful comments from a seven-piece orchestra. 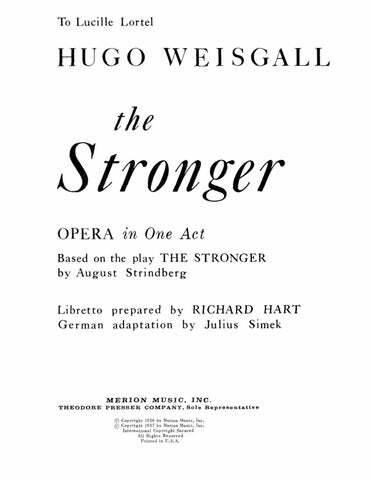 [Weisgall] is someone who knows opera, who has thought deeply about what opera in our day can and should be. His music engages the mind in ways that make one want to hear it again. Wesigall is an urbane, sensitive and thorough composer. …evocative and canny. [Weisgall’s] handling of text… is exemplary. What a pleasure it is to hear a master at work! Mr. Weisgall’s music captures our attention, …catches our ear and keeps it attached to what he is doing. Will You Marry Me? …is a short opera…that is an unalloyed delight. All small companies extant should now look seriously into producing Will You Marry Me?